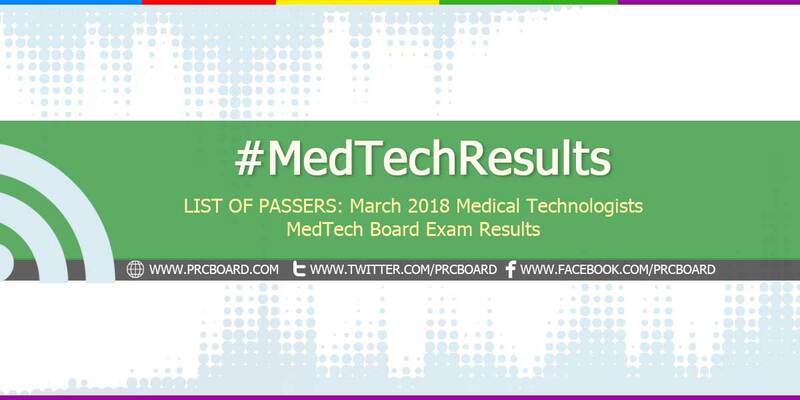 The results and list of passers of the March 2018 Medical Technologist (MedTech) board exams including the top 10 examinees, top performing schools and related announcements are available at this website as the Professional Regulation Commission (PRC) officially released the results online three (3) working days after the last day of board examination. As announced, 2,648 out of 3,644 successfully passed the exams. The licensure examinations are administered by PRC Board of Medical Technology headed by its Chairman, Dr. Marilyn A. Cabal-Barza and its members, Ms. Marilyn R. Atienza and Ms. Marian M. Tantingco on March 14 & 15, 2018 at PRC testing centers in Manila, Baguio, Cagayan de Oro, Cebu, Davao, Tuguegarao and Zamboanga. The schedule of online appointment for issuance of Professional ID and Certificate of Registration will be from March 26 to April 20, 2018. As per Resolution No. 2017-1068 entitled "Schedule of Licensure Examination for Year 2018", the target release of March 2018 MedTech board exam result will be on March 20, 2018 (Tuesday) or three (3) working days after the last day of exams. However, the above-mentioned date is not final as PRC may also release the MedTech official results earlier or later than the stipulated date without prior notice. Just keep tuning-in at at this article for timely updates. On the same exams conducted by PRC on August 2017, February 2017, August 2016 and March 2016, results were released after three (3) working days. March 2018 MedTech board exams covered these subjects; Clinical Chemistry, Microbiology and Parasitology, Clinical Microscopy, Hematology, Blood Banking and Serology and Hispathologic Techniques, Cytotechnology, Medical Technology Laws, Related Laws and its Implementing Rules and Code of Ethics. On the most recent MedTech exams conducted August 2017, 4,821 out of 5,661 examinees successfully passed. Marianne Ross Bacia Soldevilla from Notre Dame of Marbel University ranked first in the exams garnering 90.90% rating followed by Glenn Charls Lagumbay Buelis from University of the Immaculate Conception - Davao having 90.80% and Renrenz Tiangco Payumo from Far Easter University - Manila having 90.70%. Four schools shared the top spot having all of its examinees passed or 100% overall passing rate. These are; University of San Agustin, Cebu Doctors University, Holy Name University and Colegio San Agustin - Bacolod City. Below is the summary of MedTech board exam results in the last five (5) exams, courtesy of PRC. To receive up-to-date news about MedTech results for March 2018, we advise our visitors to bookmark this page, visit PRC official website or follow us at our social media pages via Facebook and Twitter. Ang tagaaaal, God bless everyone! I-post nyu na po hindi ako makakain. Goodluck sa lahat sana makapasa lahat. Juice colored baka inaadjust pa ang micro para. ang tagal naman ng result. excited na ako makapag oath taking. Pakilabas na po ang result huhu. Have Mercy on us Lord. excited na ako pumasok sa top 10... next year. anong oras lalabas ang results ng Civil Service Licensure Exams? Sa mga Centralians jan. 100%. unya pani gabie eh post ang result, sure ko hahaha. Matthew 21:22 - If you believe, you will receive whatever you ask for in prayer. Nakakakaba po..Please Lord, Bless us all.